CHICAGO-- There was a time at the BIO conference when the term genomics was scarcely known. Today it ranks with other buzz words on the exhibit floor here in Chicago and as a topic in the hundreds of meetings that happen every day during this meeting. 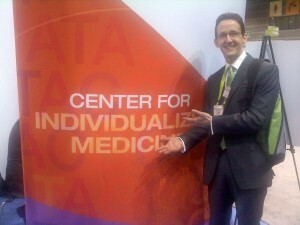 Individualized Medicine has also become a major topic in the Minnesota pavilion, especially this year. Many visitors have heard about Mayo Clinic's initiative in this field or have heard about our IM Clinic or have attended our annual conference. Present at this year's BIO 2013, is Scott Beck, administrator for Mayo's Center for Individualized Medicine, who has been holding group and one-on-one meetings with a wide range of attendees.